The amazing Milkweed Canyon is located on the Sanup Plateau in the First Nations Hualapai Tribal Reservation in northern Arizona, within the southern part of the Grand Canyon National Park. From the top of Milkweed Canyon over the course of 8 miles, it feeds into Spencer Canyon which in turn runs down into the Colorado River in Granite Gorge at the Lava Cliffs Rapids. While not a classic slot canyon, some parts of Milkweed are long, narrow passages with a stream running through all year round. There are numerous pools, cascades, and small waterfalls, and the walls contain numerous types of pink and grey limestone and thick veins of white quartz. On top of the canon it is densely-wooded and in the lower area, the canyon has plenty of desert cactus. 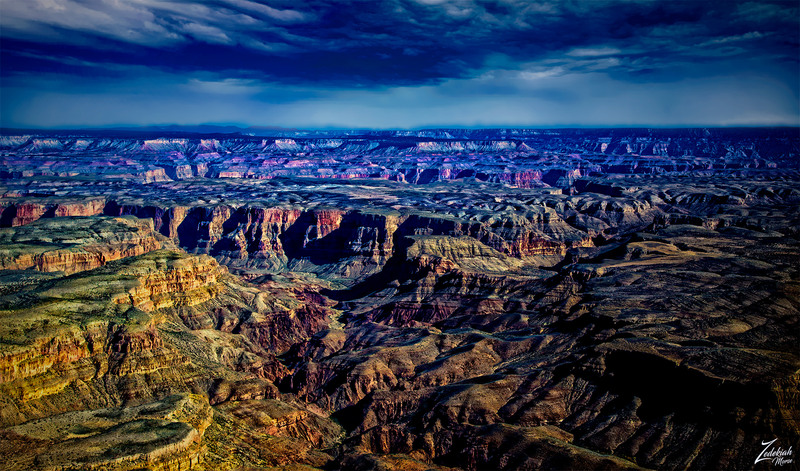 This is a particularly remote and untouched region, and though part of the Grand Canyon system it is a far removed from the hustle and bustle of the main south or north rim viewpoints. Most of Milkweed canyon is inaccessible for hiking so this aerial view lensed while flying over the area is about the only way to enjoy it!